Overall, Canadian students continue to perform well compared with students in most other countries. 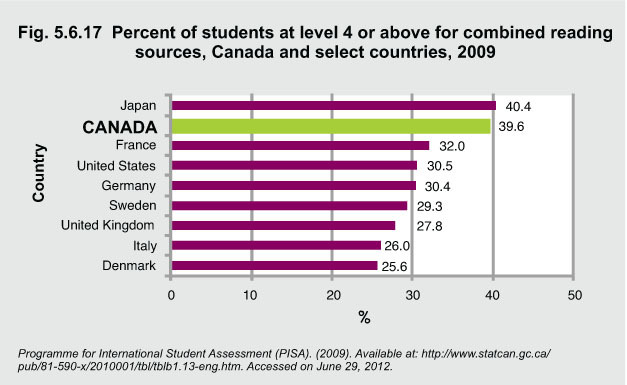 On the higher end of the reading scale, students proficient at Level 4 or above have acquired the level of literacy that is required to participate effectively and productively in life and are also capable of the moderately difficult reading tasks in PISA 2009.2Forty percent of Canadian students achieved Level 4 or above, compared to the OECD average of 29%. 1Statistics Canada. “The Performance of Canada’s Youth in Reading, Mathematics and Science.” Available at: http://www.statcan.gc.ca/pub/81-590-x/81-590-x2010001-eng.pdf -Accessed on June 29, 2012. 2OECD. (2010). “Volume 5: Learning Curves, From PISA 2000 to PISA 2009.” Paris: OECD.